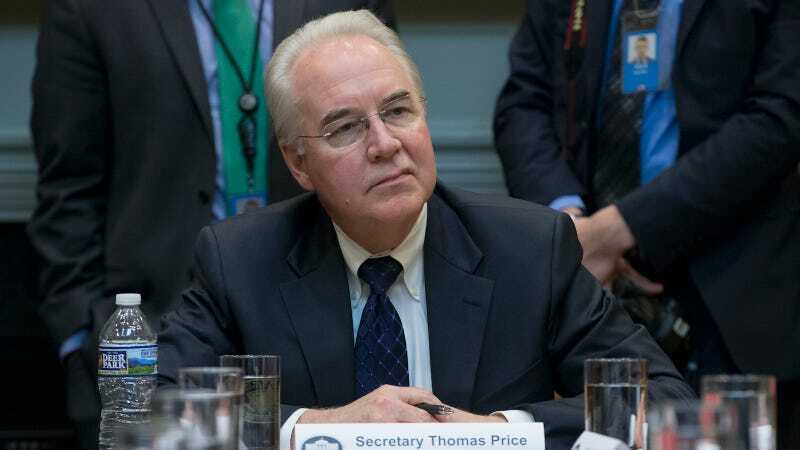 Two employees at the National Institutes of Health have forwarded Jezebel emails that appear to show the newly instated head of the Department of Health and Human Services, Dr. Tom Price, sending what they call “propaganda” for the controversial Republican healthcare replacement bill. “Former HHS secretaries, from my understanding, did not do this in years and administrations past,” another NIH employee told Jezebel via email. The AHCA, unveiled on March 6, has faced major criticism from both Republicans and Democrats. The plan will defund Planned Parenthood, enable insurance companies to charge higher rates for those who have a lapse in health coverage, slash subsidies for low-income people while lowering taxes for the wealthy, and will effectively freeze Medicaid enrollment. According to the Congressional Budget Office, if enacted, an estimated 52 million Americans will be uninsured by 2026—compared to 28 million under the Affordable Care Act—and low-income, elderly Americans will face a significant spike in premiums. Price, a former Congressman and orthopedic surgeon from Georgia, is an ultra right-wing conservative who called for the repeal of the Affordable Care Act, supports privatizing Medicare and limiting Medicaid spending, opposes access to contraception and abortion, and believes public health issues like immunization should be decided at the state level. He oversees the Department of Health and Human Services, which has 11 operating divisions that are responsible for “protecting the health of all Americans and providing essential human services,” according to the website’s overview. The NIH is the government’s primary biomedical and health research facility. Price did not respond to Jezebel’s request for comment. On Thursday, the Trump Administration proposed cutting NIH’s 2018 budget by $6 billion, or nearly 20 percent. The proposed cuts are sure to add to the fear and uncertainty NIH employees are already feeling in what the source described over the phone as a climate of “anti-intellectualism” that has evidently decreased morale.